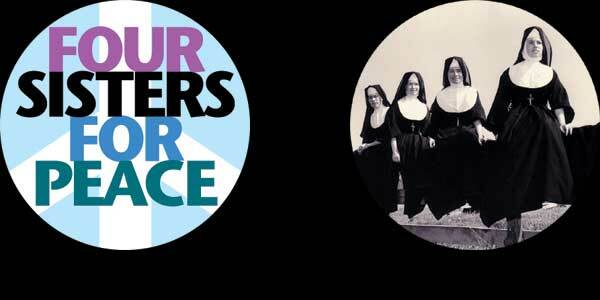 Four Sisters for Peace is a half hour documentary about peace and justice as seen through the eyes and actions of four sisters who are also Catholic nuns--Rita, Brigid, Kate and Jane McDonald. Created by a class of sixth to eighth grade students at Southside Family School in Minneapolis working with their teacher Susie Oppenheim and the artist Media Mike Hazard, this film is rated "R", for rebellious. This production has been supported by Pete Seeger, Howard Zinn, Wet Paint, Minnesota State Arts Board, Outagamie Foundation, Les Skoropat, The Student Association for the Advancement of Children as People (The SAACP) and more than 50 others. Music is by Holly Near. The program is good for all people from about ten years old and older who are interested in peace studies and social activism. For quotes from the McDonald Sisters and others, click.